“The Forest Tabernacle” is the fascinating story of Dr. Patrick D. Milroy and the journey that transformed his life. 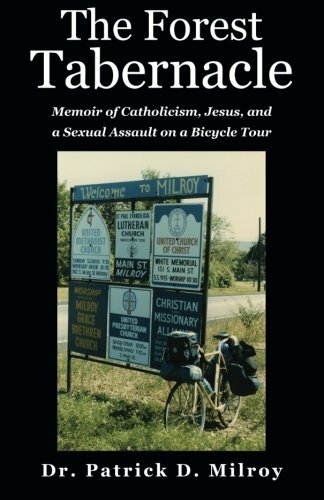 In 1986, Patrick Milroy took time off from his college education to take a bicycle tour from Ontario to Florida. He was 24 years old and dealing with issues regarding his faith and relationships. As he covers these challenging miles by himself, he has a chance to deeply reflect on his life. When he would get to the places where the ride would be a struggle, his focus would become his determination to beat whatever obstacle was in his path. This allowed him to step away from his mental dilemmas. Some of these obstacles were weather, geography and sadly, people. At one of his rest stops he was brutally assaulted. His description of the incident, and the aftermath, was something that I would expect to see in a horror movie. His will to survive and escape from the area helped him to overcome this awful incident. Fortunately, he encountered more good people than bad people on this journey. He also had a chance to delve into his issues with the Catholic church and even his own personal relationship with Christ. This journey was truly life changing for Patrick and it helped direct his future self with regards to how he would be able to help others to overcome trauma. For me, I was especially captured by Milroy’s honesty regarding Catholicism. There is so much control by the church that even as a non-practicing Catholic it is still hard to allow myself to voice questions and doubts that I have regarding this religion. The author manages to voice my doubts and brings them out in to the open. It was healing for me to use his works as a tool to finally be able to truly contemplate my concerns. He also refers to the dark characters that he encounters as the Demon Beast. I have also had individuals like this pass through my life. I always thought of them as having “the creature in their eyes.” But I can see that the darkness contained within these individuals is the same type as the ones that he dealt with. Painful lessons are learned from dealing with them, and like the author, they helped me to work with people who had similar stories. I am truly glad that I had an opportunity to read “The Forest Tabernacle” by Dr. Patrick D. Milroy. A great deal of self-reflection came from it. I also greatly admire the author for sharing his story about this amazing journey.